You’re Invited! Help SeattleDances Grow! Performances by Cabin Fever, Alicia and Daniel Mullikin of Entropy, and more! Plus, you might get to see your favorite (or least favorite!) writer get a pie in the face—because no carnival is complete until someone gets a pie in the face. More importantly, this night is for YOU! Come support the site that supports you and help us make SeattleDances better for the whole community. 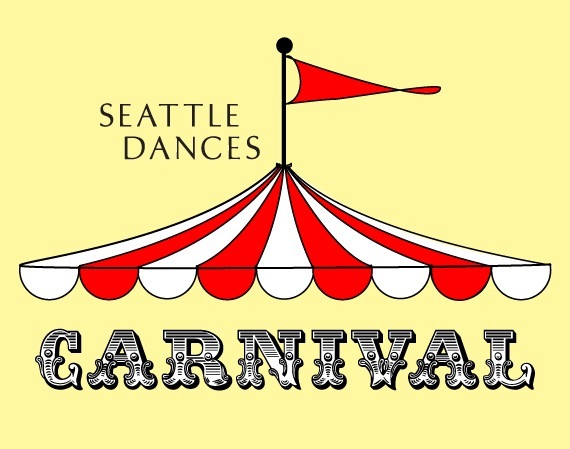 Proceeds from the Carnival will directly benefit the re-design of the SeattleDances website. Why a new website, you ask? We have outgrown our trusty blogspot, so we are getting a brand new website. With the new design, we hope to create an even better forum for the Seattle dance community with a more usable calendar, call board, and company/class information as well as greater integration with social media. While our focus will still be reviews—and we are proud to say that we have published more than 60 reviews so far in 2013—we hope to expand our content to include more previews and editorial features focused on dance in Seattle as well. As the first step in the redesign process, we are excited to unveil our new logo! Many thanks to Rosie Gaynor of Seattle Scriptorium for the design—she founded SeattleDances back in 2009, so it’s fitting that she design our first logo, too. And, if you’re feeling extra generous and want to help us get a jump-start on fundraising, feel free to make a tax-deductible donation on our Donation Page. Thanks Seattle, and hope to see you on the 18th! SeattleDances is an Associated Program of Shunpike.